Zone-Reflex: Intrasound and geomagnetism. Brain Modelling II. Earthquakes, tornadoes, hurricanes, sea waves etc. also produce infrasounds. No shield can block infrasounds, it has no dissipation, and is sustained for long time in the atmosphere. Nearly everything will recieve an impact. Resistors are very few. After Krakatoa the 'ringing' of both Earth and atmosphere continued for hours. Brilliant sunsets followed for many years thereafter. See my earlier posting 'Quantum antenna. Brain Modelling I'. I try to further explore this geomagnetic signal. Is iron the one I look for? And is a very low frequental signal, about 1 Hz one very important biological signal? What have all these phenomen in common? Each one generates silent infrasound - long sound waves at a frequency below 20 Hz. People can't hear anything below that frequency, probably for good reason. The 'song of Earth' or rather the intermittent groaning of Earth would be unbearable. Remember, in mythology Gaia gave birth to monsters. Intrasound’s extraordinary propagation capability has been known for almost a century. In 1908 it was found that the low-frequency signal generated by the Tunguska Meteor event travelled more than once around the Earth and was detected by barographs around the world. It is generally assumed that the low-frequency acoustic waves—infrasound, is minimally attenuated in the atmosphere and propagates through reflections in temperature gradients in the upper atmosphere. That propagation mechanism is believed to be analogous to the propagation of radio waves in the atmosphere. Long distance propagation is possible when waves can reach one of the temperature gradients where the reflection takes place. There are two major reflection heights: the temperature gradient in the upper stratosphere (the lower sound channel at 45-50 km) and the temperature gradient in the lower thermosphere (the upper sound channel at 90-100 km). When the source is located on the ground, long distance propagation takes place (according to the classical propagation model) only when the signal with given frequency may be detected after reflection in the upper atmosphere at the stratospheric or the thermospheric temperature gradients, that is, it is reflected back to the Earth. Fig.1. Signal-to-noise ratio for different source heights versus frequency (after Procunier & Sharp,1970). Liszka et al. It may be seen from Fig.1. that only signals between 1 and 2 Hz will be detected with the optimal signal-tonoise ratio at the ground after a reflection in the lower thermosphere. The signal-to-noise ratio is limited at the low frequency side by the atmospheric noise increasing rapidly with the decreasing frequency. Fig.2. Zonal wind profiles for three different latitudes: 40, 45 and 50N and for three months: February, March and April. 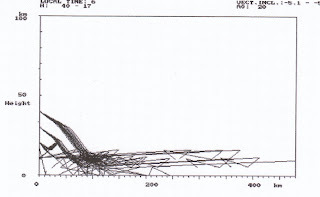 Profiles based on COSPAR International Reference Atmosphere 1986. Liszka et al. The distribution of wind vector in the atmosphere is quite complex. The wind system varies both with the altitude and it also shows a large temporal variability. The frequency of 2 Hz was selected for studies of the long distance propagation of infrasound. However, a large part of the scientific community still uses frequencies below 2 Hz for detection of distant explosive events. The purpose of the present report is to demonstrate that also frequencies between 2 and 6 Hz may be of interest for long-distance detection. An International Monitoring System (IMS)today use 0,01 - 5 Hz. Fig 3. Acoustic ray-paths projected onto vertical east-west plane, for the summer- and winter-mean wind model. Both East- West and North-South propagation is shown. The source is located in the origo (after Georges and Beasley, 1977). Liszka et al. The 'Earth net' is 1 - 2 Hz, or below 1 Hz? The ability of the Model 1 simulation to predict the D was found highest for 1 Hz and decreasing with increasing frequency. The lowest ability to predict the D was observed at 5 Hz. There are indications that, at least at low latitudes, the tropospheric winds may be, to some extent, anti-correlated to the stratospheric winds. The primary goal of infrasonic detection is to determine the true angle-of-arrival to localize the source. When dealing with high intensity infrasound waves, as those generated by explosions, it may be expected that non-linear effects will influence the observed wave-field. High intensity infrasonic waves may generate solitary vortices in the atmosphere. Fig.4. 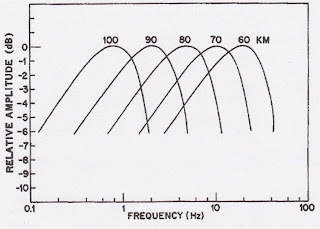 Propagation of sound waves during the descent of a Castor 4E rocket. The lowest ray originates at the lowest supersonic altitude of 17 km, the atmospheric model with Gaussian-distributed irregularities in wind and temperature is used. A large fraction of the rays that originated at heights above 18km now reach the ground at distances up to 250 km. Liszka et al. Michael Hedlin has found infrasounds from sprites, which are short flashes of light in the atmosphere above thunderclouds. Aurora Borealis generate infrasounds, by pushing the surrounding air outward. It 'swish, crackle, sizzle, thunder... sings'. Certain auroral sounds stimulate physiological responses that will never register in biologically unmodified electronic systems. The signal arise in the body? A chemist that got an auroral grounded through his lab reported incredible luminescence produced in several platinocyanides, electro-phosphorescent chemicals. A radio tower got the same visitor, and the engineer reported crackling everywhere, he was unable to transmit any signal power, felt completely electrified, smelled ozone and a colored column suffused the tower,a multicolored appearance. Eskimo legends of auroras are fear-filled. Their tales also report 'taking of souls' by ground walking auroras. These vortices were found to occur usually in connection with intense weather fronts. There are some indications that these vortices occur in the troposphere, at few kilometres height. The arrival of intense infrasonic waves from the explosion site was associated with the simultaneous occurrence of atmospheric vortices overhead of the array. The vortices act as secondary sources of infrasound in the surrounding of the explosion site. I was once climbing a mountain and reached the jet stream winds. They really felt different than usual winds. You could actually feel how the wind beats you. The beating frequence is 30 - 40 Hz. The winds was merely linear. The place I visited was a sacred place by the Vikings. The ancients all over the world knew these things, that we now have forgotten. 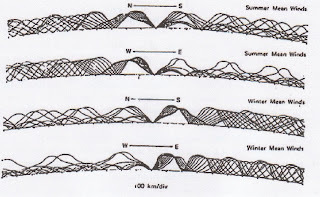 Fig.5.The winds above 18 km. The difference D (upper graphs) and the width of the distribution W (lower graphs) for summer 2007 as a function of signal frequency. The vertical axis of each graph shows the day number. Liszka et al. The wind data (magnitude and direction) was converted into the zonal- and meridional components, which could be used in a numerical model, and show a remarkable fine structure in the wind system, especially above the tropopause. Funny that the name meridians in Traditional Chinese Medicine actually is derived from the Earth meridians. It was a misconception from the european scientists, that may hold some truth. Fig.6. Correlation ellipses plotted on the xy-plane, with North directed northward. The x-axis is at the same time the time axis (in minutes UTC) and the centre of each ellipse is plotted at the respective time of observation. The explosion of August 21, 2006 recorded in Kiruna. The vertical scale is in meters. Liszka et al. In the monitoring is used even as low frequencies as 0,15 - 0,01 Hz. The signature of the volcanic eruption was clearly visible at 0800 UT both at low (0.01-0.15Hz) and at high (0.4-4Hz) frequencies. Stronger and stronger infrasound signals led up to the volcano's eruption in 1998 in Japan, said Milton Garce´s. 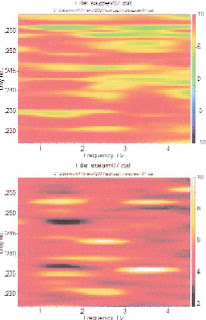 In Guatemala was a strong intrasound generated too, mostly below 10 Hz. corresponding to 120 decibels. Michael Hedlin is able to look at the infrasound recordings and say that gas is bubbling up. Fig.7. 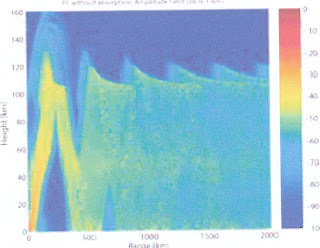 Sound field for a ground source propagating at 0,1 Hz (left) and 1 Hz (right) showing the difference. Liszka et al. In earthquakes the ground becomes the surface of a drum, ringing out at infrasonic pitch before the event. The ground undulates. Deep shocks produce strong infrasonic pulses. The two independent observations (mid-latitude trough and plasmapause positions) and an empirical model have been compared on a global scale and found to be in excellent agreement. The mid-latitude trough and plasmapause are on the same field line. Observations during the equinox and solstices and during quiet and disturbed periods are analyzed. In addition, positions of the mid-latitude trough are calculated using a simple empirical model. These 'sounds of silence' are claimed to be sensed by animals but not humans, not with hearing sense, but maybe with some other sense. We use to call it the sixth sense. This has come forth for earthquakes, tsunamis, bombs, even the turbulence from airplanes. Large amounts of air is set in motion. Certain animals, fish, can hear infrasonic sound. Animals react by attempting to escape the area. They cannot locate the source and center and move circular in panic. Elephants are producing infrasounds too when they trumpet, and detect it too, in that way they can reach other elephants as far as 10 km away. They can perhaps even pick up the waves through their feets. Whales, rhinos, big birds like cassowaries, dinosaurs etc. may pick up the sound, but not always through hearing. Cassowaries use the casque comb on their head. It is possible that people too can detect infrasound in special ways. When elephants trumpet it's such a powerful, low-frquency sound, that you feel resonating in your chest. Whales use infrasound as weapon. The powerful sound stun their pray. Called 'gunshots' whales focus these blasts at large squids and other fish to paralyze them. The sound alone may even torn their pray apart. Whales can also use the acoustic projections as a shield. Infrasonic shock flattens the body,like one was struck with a solid, invisible wall. There are physiological effects too, like extreme emotional distress, fear, anxiety, mental incapacitation, nausea and a sense of being helpless. An 'alarm system'. Physiological reactions remain long after the infrasound has gone. Every environmental sensation is felt ultrasensitively. Extreme irritability has followed. Sustained negative influence on consciousness is reported. Less than 5 min exposure to 10 Hz infrasound give dizzieness that last for hours, 12 Hz infrasound severe and longlasting nausea after a brief, lowintensity exposure. 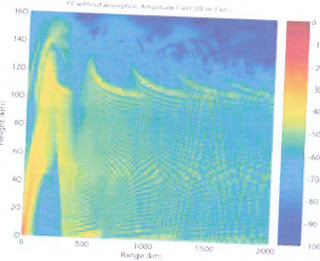 Ocean waves produce 16 Hz as an anomalous acoustic phenomena, 'barisal guns, fog guns,lake guns'. A 'booming' is not isolated. Some shocks are irregular, but other water-related are periodic, comes at certain times of the day, month, year. Other anomalous natural tones like bells, organ or tuba tones are reported. These sounds are generated in certain environments in a complex woven mechanic net. People can be hospitalized by 'boom' illness. This has always been a very bad sign. Certain bays are known for a high incidence of such 'illness', a resonant baywater 'heavings' that occur daily. The sickening effects are seemingly stored up in physiology. Waterfalls generate infrasound and give nausea, as wind, storm, thunder, lake or glacial ice, tidal waves, huge ocean throughs, desert hummings etc. Aerial 'earthquake' sounds has also been reported. High intensy solar flame events are known to induce electricity into the wires,that must be insulated and grounded. Also into the human minds. Standing arcs of brilliant blue current is reported. Solar wind give intermittent effects on atmospheric pressure,which has disturbing effects on weather and human behavior and health. They have obvious sociological implications. Solar flare impacts struck the Earth like a bell. Inconsistent pressure density induce harmonic atmospheric disturbances that modify and chaoticize emerging weather patterns. Storms can radiate a cyclonic serie of expanding infrasound. Fear proceeds hurricanes. Seasonal wind, the Mistral, and Fohn weather patterns produce illness in some people. There are individuals suffering from 'seasonal nervous exhaustion' and other ' neurophysical maladies'. Whenever a Mistral blows there will be increased emotional tension, depression, loss of objective judgement, disorientation and diarrhea and irritability. Travel sickness can be associated with infrasonic vibrating chassies. Stomach upsets are also reported from 'underground rumbles' in small areas. The infrasound focus on certain ground points. These pulses can blow up windows, stong rock walls into pieces, often when winds seemingly ceased for an instance. During that short interval infrasound wave impulse may be strong. Vision has showed pictures can be detected although not consciously, when there are as instance advertising pictures laid in between ordinary pictures in a film. Humans react on the advertising, although they is not aware of it. In an experiment in England infrasound was played during a music performance. Although listeners couldn't hear it,they seemed to have stronger emotions during the performance than people who heared music without infrasound. Acoustic ultrasound emission has also been seen in plants from dehydration. Some events are generated by other than cavitating vessels or fibres. Signal absorption within the tissue is one possibility. Of critical importance is the comprehension of human tolerances to infrasound. Military pilots can have serious cosequences of minor errors in judgement, or even hallucinations. Pilot reflexes are severly diminished. Decrements in vision, speech, intelligence, orientation, equilibrium and ability to make reasonable desicions. Henry E. Bass and Claus H. Hetzer - An Overview of Absorption and Dispersion of Infrasound in the Upper Atmosphere, in the same issue. Alexis Le Pichon, Elisabeth Blanc, Alain Hauchecorne, 2009: Infrasound Monitoring for Atmospheric Studies. Springer Netherlands. Part I. Cap.15. Catherine D. de Groot-Hedlin, Michael A. H. Hedlin and Douglas P. Drob, Atmospheric Variability and Infrasound Monitoring. DOI 10.1007/978-1-4020-9508-5 Also as a google book. Stenflo, L., 1987, Acoustic solitary vortices. Phys. Fluids, 30(10): 3297.